Thorens revives classic TD 160 turntable design | What Hi-Fi? With its acquirement by Gunter Kürten and consequent relocation to Germany last year, classic turntable brand Thorens is in the midst of a revival. Its next new decks, which will launch at the Munich High End Show in May, will be the TD 1600 and TD 1601 - modern incarnations of the original TD 160, whose 2008 descendant (the TD160HD) we regard as one of the best 15 turntables of What Hi-Fi? 's lifetime. Both models use the familiar sub-chassis spring suspension and damping method for effective decoupling, with the sub-chassis standing on rather than hanging from the springs this time. A steel thread connected to the sub-chassis has been included to prevent any unwanted horizontal movement, too. 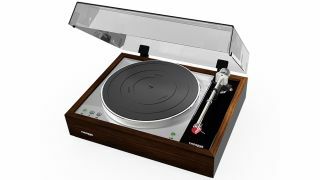 While both models share the same wooden plinth and dual-platter make-up, height-adjustable TP 92 tonearm, motor, control unit and power supply, the TD 1601 adds some extra features for convenience, such as automatic electrical lift, auto power down at the end of the record and a pair of balanced XLR outputs. Contrastingly, the TD 1600 is a completely manual turntable. Both will be available in high gloss walnut and piano black, with prices to be confirmed.